Shouldn't your tailor-made vaca­tion be ar­ranged by your own travel ex­pert in Si­cily? Sicily Con­cierge will plan your trip from ar­rival to de­parture, whether it's a one-day excur­sion or a one-week itinerary. You can ex­pect real travel services from real travel agents. Start dream­ing, and visit Sicily Con­cierge. Castles in the clouds are just the begin­ning. EXCURSIONS for Segesta, Piaz­za Armer­ina, Erice and Agrigen­to with regularly scheduled de­partures from Pa­lermo almost every week of the year. Why drive or hire your own chauf­fer? Join one of our con­venient day tours! Ex­pect a small group and great service from the only com­pany that offers these tours regular­ly. Visit our site for de­tails on these excep­tional Palermo ex­cursions. Active Ex­cur­sions on Etna. From hik­ing to jeeps to quads, ex­plore Eu­rope's great­est vol­cano with expert guides. Don't miss the ex­peri­ence of a life­time! Read more about these fan­tastic Etna ex­cur­sions. See Si­cily with a great Si­cily tour! • Small group size, usual­ly fewer than 16. • Con­venient itineraries with just 2 or 3 hotel check-ins. • Tours al­most every week. • Good prices be­cause there's no re-seller be­tween you and us. • "Must-see" sights plus a few "secret" ones. • Choice of several tours. • Good hotels and restaurants. • Person­alized services like air­port pick-up or ex­tra nights before/after your tour, be­cause our staff of Si­cily travel specialists is based in Si­cily. • Visit us right now for de­tails, FAQs and reserva­tions. We also do cus­tom tours, for groups of any size. Dine in a rustic restaurant, or enjoy rural lodging, hiking, wine tastings, cooking classes and more. Visit our working winery near Alcamo and Camporeale in the hills of Sicily's enchanting wine country. Visit our site for more information. 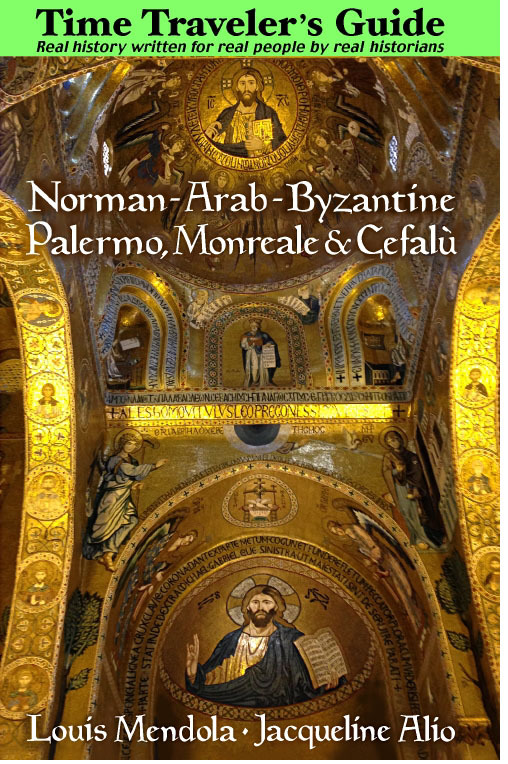 Time Trav­eler's Guide to Nor­man Arab Byzan­tine Pa­ler­mo, Mon­reale & Cef­alù. Dis­cover the greatest won­ders of med­ieval Si­cily. From Ama­zon US, Ama­zon UK, Ama­zon CA, Barnes & Noble, BAM!, Water­stones, Indigo, Fish Pond and other ven­dors. Pa­lermo: Lib­rer­ia del Cor­so. Mon­reale: Cathe­dral Book­shop. The travel guide for Palermo and northwestern Sicily. Sights, hotels, restaurants, shopping, tours. Come See Palermo. The best (impartial) list: While we really don't like "Top 10" lists, they're a convenient way to plan itineraries and a good source of travel ideas if you're travelling independently, without the assistance of a travel agent or travel consultant, and your time in Sicily is limited. These are very special places. "Tourist attractions" are for those who think of themselves as "tourists," but you are a guest. We've selected a dozen places rather than ten and indicated two worthy "options" to bring the total to fourteen. Factors such as the airport you arrive at (Catania or Palermo) and driving distances may dictate your choices. Our map of Sicily provides a good idea of geography and distances. (The Localities and Sights pages are also useful, and there are pages dedicated to Sicily's beaches and the mountains.) For convenience, its easiest to make a city like Taormina or Palermo your base for daily excursions to various places around Sicily. Getting there should be enjoyable too; since Sicily isn't just about "sightseeing," the page dedicated to Sicily's splendid scenery and geography (a 'companion page' to this one) is a good starting point in finding the landscapes and scenery en route to the history and culture that awaits you. The trip planning page has information on car rentals, hotels, flights, restaurants and much more. • Aeolian Islands: These delightful islands are especially appealing in warmer months, but expect crowds in August. In winter ferry service (from Milazzo on the Sicilian coast) is sometimes cancelled for a few days due to bad weather. Otherwise, the beaches are exceptional and the cuisine fantastic - especially, as you would expect, the seafood. • Agrigento: The "Valley of the Temples" is a large archeological site outside town surrounded by olive groves and almond orchards. The almond blosson festival (in late February) is rooted in enchanting folklore. Agrigento boasts several ancient Greek temples, including the Temple of Concord, one of only two completely standing ones in Sicily. The other is at Segesta (mentioned below), and if time is very limited we suggest visiting either Agrigento or Segesta. • Cefalù: To describe Cefalù as western Sicily's "Taormina" may be a slight overstatement, but it is certainly the most similar thing you'll find, so don't miss it. The design of the splendid Norman cathedral was based on a French one, but nothing else in this seaside town owes much to anything but Sicily's own multicultural influences. There's an ancient Sicanian temple on the rocky cliff overlooking the town, and the ruins of a castle. The town itself offers pleasant narrow medieval streets and interesting shops. There's also a public beach. And all just an hour from Palermo, making Cefalù a great excursion idea if you're staying in the capital. • Erice: This hilltop town was successively Elymian, Phoenician, Carthaginian and Roman. Its grey stone forms Punic walls, a castle, church and medieval streets that could almost be mistaken for ancient ones, bringing to the Good Friday passion procession an atmosphere rarely matched anyplace in Italy or Greece. But there's much more to Erice than this singular annual event. While you're here, don't forget to try the local pastries. • Mount Etna: Europe's greatest natural wonder is a living, sacred mountain of legend and myth. Consider a jeep excursion to the upper regions, which are covered with snow for four months of the year. Dress warmly in summer too; it's always cool at the top. 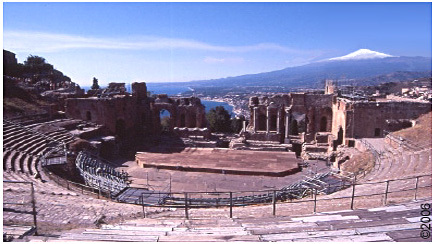 (In the classic scene shown here Etna is viewed from the Greek amphitheatre at Taormina.) This is Sicily's highest mountain at approximately 3350 meters. • Monreale: The arcane fact that a mosaic icon of Thomas Becket graces the apse, and that it is the earliest holy image of the English saint murdered in Canterbury Cathedral, is just one of many fascinating features of this twelfth-century cathedral and cloister built on a hill in the eclectic Norman-Arab style with Byzantine artistic elements. (Another "secret" fact is that the heart of Saint Louis is preserved here.) No trip to Palermo is really complete without seeing Monreale, which overlooks the city and its vast valley. Plan to spend at least two hours in this peaceful place. You'll rejoice that you did. If you're here around lunch time (or for dinner) enjoy a pizza at Dietro l'Angolo off a street behind the apse; the view from their terrace is stupendous. • Nebrodi Mountains: An alternate selection to the wine region (described below), the Nebrodi Mountains are the most lushly forested region of Sicily. 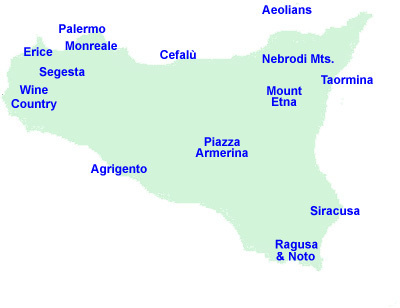 Situated to the immediate north of Etna, the range boasts some of the island's highest peaks after the volcano itself (though several in the Madonie Mountains to the west exceed them). The unique Nebrodian appeal is its complete departure from any common stereotype of "Mediterranean" landscapes and the visitor's consequent realisation that much of Sicily looked this way when the first Phoenicians, Ausonians and Greeks arrived over two thousand years ago. Our favourite drive is along the SS 289 from Cesarò high in the mountains to San Fratello and Sant' Agata Militello, a truly lush area that, with its high snowfall from late December into the middle of March, often looks more Swiss than Sicilian. A stop at Villa Miraglia, a lodge on the SS 289 in the middle of the forest, offers a chance to sample lamb, goat and the boarish Nebrodian Black Swine, and it's not far from a road leading to Mount Soro - at 1847 meters the highest peak in the chain. • Palermo: Sicily's regional capital and largest city is perhaps best compared to a rough, uncut jewel. Its beauty has to be revealed through careful discovery. You'll find this bustling city chaotic and dusty yet interesting. The historic environment of this former royal capital of kings and emirs is largely Baroque with some stunning nuggets of medieval architecture. The Norman Palace, with its Byzantine Palatine Chapel (a Monreale in miniature), is built upon Phoenician walls. There are a number of monasteries and castles, and a magnificent cathedral, as well as art galleries and a good archeological museum. Monreale is only a few kilometers outside town. Palermo is a great western-Sicilian "base" for excursions (day trips) to Cefalù, Erice, Segesta, Agrigento and the wine country. • Piazza Armerina: The Roman villa outside town has the most extensive mosaic pavements of the ancient Roman world, composed of rural scenes, pictures of flora and fauna, and classical motifs. Most of it is in exceptional condition, looking as if it were completed yesterday. The structure was the home of a wealthy Roman who loved art. 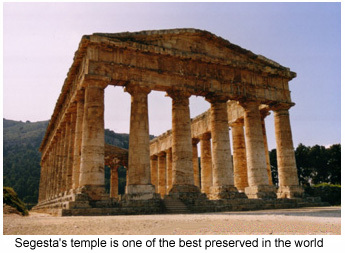 • Segesta: We mentioned that Agrigento has one of Sicily's two completely standing Greek temples. The other is at Segesta. Out of justified pride, a few of today's Greeks might disagree, but this is the best-preserved ancient Doric temple in what used to be the Greek world. The site's ancient amphitheatre, set on a hill, boasts a magnificent position. If time is very limited, we suggest that you visit either Segesta or Agrigento. • Siracusa: Archimedes, Plato and Saint Paul loved Syracuse, and with good reason. It was one of the most important cities of the ancient Greek world, and the most important in Greek and Roman Sicily. It was also one of the most beautiful. The archeological park is extensive, while the old city, Ortygia, with its charming, narrow streets (closed to most traffic), boasts some fascinating treasures. The cathedral was the ancient Temple of Athena, whose columns and walls are still visible throughout the church. Carved into a limestone hypogeum, Europe's oldest mikveh is a special piece of Judaic heritage not to be missed, and you can even stay in the Hotel alla Giudecca above it. Among the cognoscenti, Siracusa has developed a reputation as a kind of "intellectual" alternative to tourist-filled Taormina. For ambience as well as cuisine, La Foglia, at Via Capodieci 29, is an exceptional restaurant in town, not at all "touristy." If your cultural or architectural taste runs to something more Baroque, consider Ragusa and Noto to the south. • Taormina: This mountaintop town overlooking the Ionian coast is Sicily's most famous resort, full of restaurants and shops, with beaches nearby. Its historical side is ubiquitous. The Greek amphitheatre, with its famous panoramic view of Mount Etna and the coast, is used for concerts and plays, and medieval walls enclose the old town's stone streets (many closed to traffic). There are several castles, including those in the Castelmola overlooking Taormina. Ignored by most visitors, Castelmola is well worth a visit. A visit to Etna is a day-long excursion, and if you enjoy nature the Alcantara Gorge is also appealing. Taormina makes a good base for day excursions in eastern Sicily. From May through September the town is crowded with vacationers and tourists, so a "low-season" visit (October through March) is highly recommended. For a unique hotel consider the San Domenico Palace, built in a restored medieval monastery, or Villa Angela, carved into the rock high above the town. Taormina's best restaurant for cuisine, the view and atmosphere? A good choice is the Gran Duca, in a historical building at Corso Umberto 172. • Wine Country: An alternate selection to the Nebrodi Mountains, Sicily's viticultural region covers a large patch of the western part of the island. Marsala is the commercial center of this scenic region. You can sample Sicilian wines at virtually any restaurant in Sicily, but actually finding the most scenic viticultural landscape can be elusive. Here's a clue. From Salemi, take the SS 188 to Marsala. Along this "secret" route you'll find little traffic but an endless series of gently rolling hills carpeted with vineyards as far as the eye can see. It's a magical place that rivals any grape-growing region in the world in its serene magnificence. It also has what is in some ways a more distinguished history. That's because domesticated grapes were cultivated here long before they were introduced into France or northern Italy. If you come from Palermo, Segesta is a convenient stop en route to Salemi. • The Baroque Southeast: An alternate selection to Piazza Armerina or Siracusa, the towns of Ragusa and nearby Noto, with their palaces and churches in the Sicilian Baroque style, are something truly representative of 18th-century Sicilian architecture and art. The landscapes of the Hyblaean Mountains, and even some of the architecture of these towns, are rather similar to what you encounter in Malta, which really isn't very far away. Beaches and the coastal Vendicari Nature Reserve are an easy driving distance from both cities.